Webinar series 2019: please share your suggestions with us! Within the framework of the One Planet Sustainable Tourism Programme, the Government of France, UN Environment and UNWTO are collaborating to provide a series of stimulating webinars to advance SDG12 on sustainable consumption and production in the tourism sector. Each session aims to broaden the experience of tourism professionals by sharing knowledge of science-based and real solutions for implementing sustainable tourism on the ground. 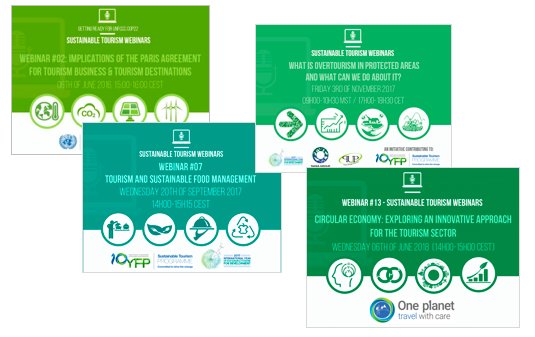 Prior to launching the 4thcycle of webinars and in order to ensure that these webinars respond to the needs and expectations of the network, the Sustainable Tourism Programme launches a brief survey on webinar series 2019. What type of information interests you the most? Tools? Inspirational case studies? What topics you would like to discuss with international sustainability experts and frontrunning practitioners? Are you ready to share your own experience and work? Please respond to a brief survey (2 minutes) on your preferences by clicking on the link below.